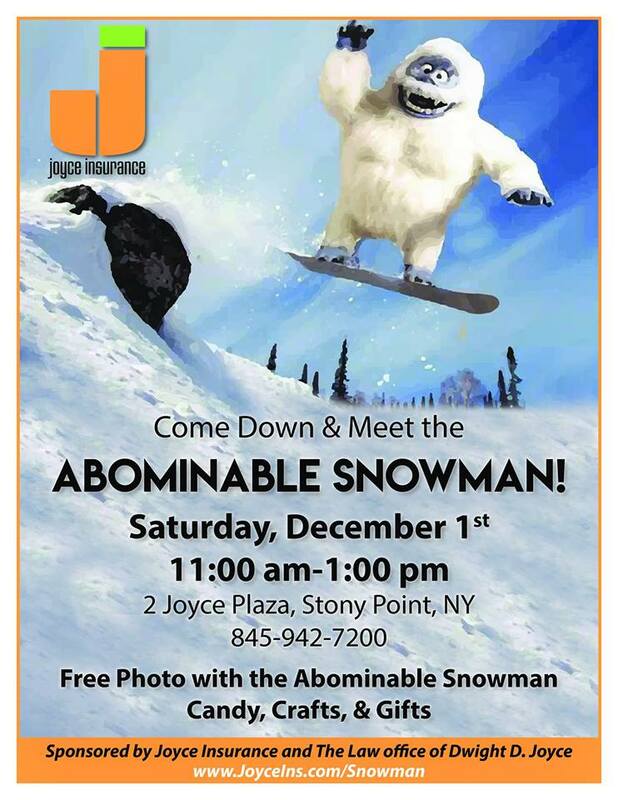 Come to Stony Point on Saturday, December 1 and meet the Abominable Snowman, 11 a.m. to 1 p.m. at 2 Joyce Plaza. Take a free photo and celebrate with candy, crafts and gifts sponsored by Joyce Insurance and the Law Office of Dwight D. Joyce. Go to JoyceIns.com/Snowman or call 845-942-7200 for more info. Tonight, Thursday, November 29, “Pitch Thursday” at Industrial Arts Brewing Company at the Garner Art Center, Garnerville will have music starting at 6:30 p.m., featuring Nev Cadesca of West Haverstraw. Paintings on exhibit “Gravity’s Wings” by Sharon Falk. Visit garnerartscenter.org for more info. Westchester Broadway Theatre in Elmsford will have five great shows in December starting with Superstars of Dance, the matinee and evening on Monday Dec 3; Neil Bergs “Broadway,”.Tuesday, December 4, matinee and evening; Tribute to Johnny Maestro and the Brooklyn Bridge, evening show; “The Magic of Christmas” with the New York Tenors Daniel Rodriguez, Andy Cooney and Christopher Maccio, Tuesday December 11; and the Edwards Twins, impressions of 100 stars, December 17 and 18 matinee and evening. All with great food. Call 914-592-2222 or go to broadwaytheatre.com. ArtsRock will be presenting in the Milk and Cookies Playhouse a Puppet Festival with puppeteer Bonnie Duncan and “The Emperors New Clothes” January 20 at 2 p.m. Go to artsrock.org. Laurie Berkners Band Holiday Show at Tarrytown Music Hall, Tarrytown December 1 and 9. Go to tarrytownmusichall.org. Kerry Lewis and Tom Cotter comedians at Levity Live tonight, November 29, and Dec. 1, 2 and 3 at Palisades Mall, West Nyack. Go to levitylive.org. Rockland Conservatory of Music will be presenting “Overtures” with Anna De La Paz, Edith Ramirez, Enrique Lopes and Joy La Veulta and a Flamenco Ensemble Saturday, December at 7 p.m. at 45 South Main Street Pearl River. Call 845-356-1522 for more info. A free holiday concert offered by Morning Music Club Tuesday December 4 at 10:30 a.m. at Nauraushaun Presbyterian Church. Seasonal songs led by Melissa Manning and guest artist Kathleen Reveille, mezzo soloist who recently made her debut at Carnegie Hall. Call 845-267-8084.